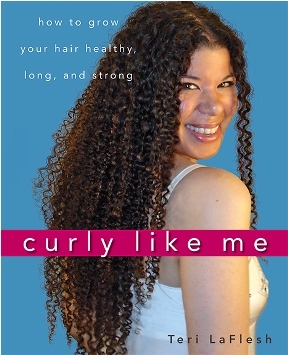 Teri has chronicled her hair care journey from shorter to longer curls, in this informative curly hair resource on how to grow tight curly hair healthy and strong. NHGrows: Thank you so much for doing this interview. How does it feel to have your book published? Teri: I’m really honored you asked me to do this interview! I’m ecstatic to have my book published! To be honest, I’m still in shock. I can’t believe the book is real, that it’s really out there in stores. I see it in a bookstore, but it still hasn’t sunk in that that book is my book. It almost feels like it’s a book I’ve just happened to have read many many times and I’m really familiar with it. I have to remind myself that it’s mine. 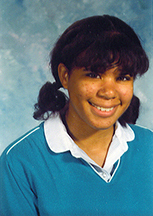 NHGrows: If you could time travel, what advice (hair or otherwise) would you give the you of ten years ago? Teri: Actually, the entire reason I wrote the book and put up the site was that this was all the information I wish I’d had when I was growing up. If I’d known this information as a teenager, I could have saved myself so much time, energy, and frustration. Luckily the me of 10 years ago was pretty much on the track I am now, but wow, the me of 20 years ago needed lots of help! NHGrows: In your book, you tell readers how to choose the best products for their hair and are ultra specific about which ingredients do what, no matter how scientific sounding. I know you also have an ingredient database on your web site. Does it really matter what ingredients do what? How has your hair changed from you adhering to ingredient labels? Teri: That’s a great question. Okay, this is a long answer…I hope you are sitting in a comfortable chair. I learned about ingredients the hard way. Back in the day I used to spend most of my free time and money searching for a miracle product that would “cure” my hair (not realizing it was chemical damage and not knowing how to care for it that was causing my problems). I’d read what the bottles promised they could do, how they could repair my hair, and I’d buy them and be disappointed each time. So I thought maybe I wasn’t buying expensive enough products, so I spent more money on higher end things, and still they didn’t work. I began looking at labels for a new miracle ingredient I hadn’t tried before (I didn’t know what any of the ingredients did, mind you, I was just looking for something that looked special). The clincher came when I found a product with RNA in it. This was before I’d gone back to school for Botany, so all I knew was that this had to be something important. So I spent food money to buy this bottle of $30 conditioner. And of course it didn’t work either. So that’s when I began researching what the ingredients really did. It turns out that the only place a product has to tell you the truth is in the list. Since I’ve been reading the ingredients label only, the mystery is gone about what’s in a product. Surprisingly, products are more alike than you’d think. Once you learn the ingredients, you basically know what a product can and can’t do, and you can avoid harmful ingredients, and you don’t fall for marketing gimmicks or fear mongering about perfectly fine ingredients. I save so much money not chasing miracles, and buying reality instead. So to answer your question, my wallet is much happier, and so is my hair now that I know what most all the ingredients in a product do. Since I’m not relying on some miracle product to “cure” my hair, but am caring for my curls in a way that makes them happy, my hair is much healthier. I view products more as simple tools that are there just to help make my job easier—instead of relying on them to do all the work for me, or to cure damage I’ve done. It’s this that’s made my hair (and my life) so much easier. NHGrows: Congratulations on your newlywed status. I have to ask, what does your husband think of your hair care routine? Teri: Thank you for your kind congratulations on being newly married! 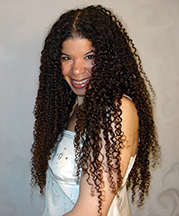 My husband has been fascinated with my hair care routine, and about very curly hair in general (he’s naturally straight-haired). It’s a whole world he wasn’t aware of. He even went with me to see Chris Rock’s “Good Hair” and was alarmed when he saw all the things women were doing to their poor curls to change them. He’s the one who built and custom programmed the tightly curly site (he’s a programmer) so I could put all the ingredients on there, as well as the answer bank. NHGrows: At what point in your hair growth journey, did you start feeling content with yourself and your hair? What do you think led to that contentment? 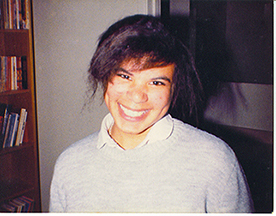 Teri: I spent my entire adolescence and 20s fighting and hating my hair. I did everything I could think of to “fix” it (not realizing that trying to change my hair was the problem). Back in those days I was obsessed with my hair, and spent nearly all my free time trying to find answers to how to deal with it. 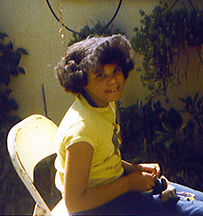 Then I finally grew out the chemicals, and bit by bit began to figure out what my hair needed. Once I’d pretty much figured out my hair, I went back to school, stopped thinking about my hair, and finally moved on with my life. So it wasn’t until I was out of school and working in a lab that one day I realized my hair had grown past my waist—and I hardly even thought about it anymore. It was then that I knew something wonderful had happened with my hair. And not only was I finally happy with my hair, but I was happy about my life. It was a big revelation for me. 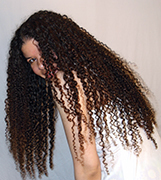 NHGrows: What are 5 tips you would give to the newly natural to growing healthy hair? Teri: First I’d like to say congratulations! Growing out your natural hair is a gift you’ve given to yourself that just gets better and better over time. 1. Be patient. Hair only grows about ½ inch a month and you can’t force it to grow any faster. The goal is to keep every inch of your new growth by being loving to it. 2. Cherish this time with your hair. You are discovering a whole new part of yourself. 3. Be very gentle. These curls are probably really new to you, and they can’t be treated like the hair you used to have. Treat your curls like the precious works of art that they are. 4. This is a great time to learn what makes your hair happy. You can practice how to comb your hair gently, how to define your beautiful curls, and try out lovely hair adornments like barrettes, headbands, flowers. 5. Our hair is fragile, and what prevents our hair from growing long is damage. Once there is no more damage, our hair will grow. 6. (This is a bonus tip): It’s best to use lots of a slippery conditioner (and with very wet hair) when combing out our curls. It helps the comb (or Denman) glide through your curls and eliminates tugging, stretching, and friction (which cause damage). NHGrows: What are 5 no-nos when trying to grow longer hair? 1. Try not to do anything that will hurt your hair. It’s only when we eliminate all forms of damage that our hair grows. This is so crucial that the next steps talk about a few of the ways hair can be damaged. 2. Avoid flat irons, or any “treatment” that uses flat irons, no matter what miracles the treatments promise you. 3. Avoid rough combing or brushing, or over-combing your hair. It’s easy to get impatient and not take the time our hair needs to gently comb it. 4. This might seem obvious, but avoid damaging chemicals. There is no such thing as a gentle treatment that permanently physically alters your hair. Even if they have something catchy in the title like “natural”. If it can change the structure of your hair, it damages it. They don’t have to tell you the truth on the product. 5. Never pull your hair apart like a wishbone. This will stretch and damage it, and usually causes ferocious snarls. NHGrows: You have your desired goal length; What three things did you discover about yourself during your hair journey? 1. I learned to face what I feared. By doing so I found out that the hair I’d thought was a crazy enemy turned out to actually be a misunderstood friend. 2. I learned to take a breath, stop, and figure things out instead of hacking away at what I didn’t understand blindly and in frustration. 3. I learned that we are most beautiful when we honor what makes us most unique. NHGrows: You have allowed us to share in the process of creating your book by building a website about your hair growth journey. Would you like to share any future projects with our audience? Teri: I’m actually writing another book. This one is a collection of funny childhood stories up until I was about 8 years old. I was an odd and stubborn child, and I still remember much of my childhood logic that seemed to get me into trouble. It’s funny as an adult to remember how my mind used to process the world around me, so I put all that in the book, too.